"A mixture of diced chicken breast, creamy soups, onion, potatoes, carrots, peas and broth is topped with a margarine/flour/milk mixture and baked to warm, wintry perfection." See how to make a delicious one-pot meal. Eh. There was nothing great about this. The flavor was okay, but the crust just didn't turn out good at all. I'll stick with a regular crust and my old recipe next time. 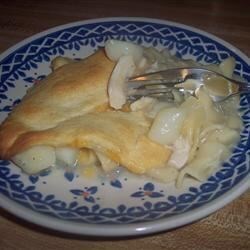 This is the best chicken pot pie we have ever eaten! I cook ingredients a day ahead, asemble pie and bake a day later! Feeds a crowd. Just wonderful for Sunday dinner!